While exports are important to US agriculture, US farm groups, trade analysts, and policy makers often neglect the impact of imports on the domestic farm economy. Last week, in looking at beef, we saw that imports left us with a negative balance of trade despite increasing exports; imports grew faster than exports. 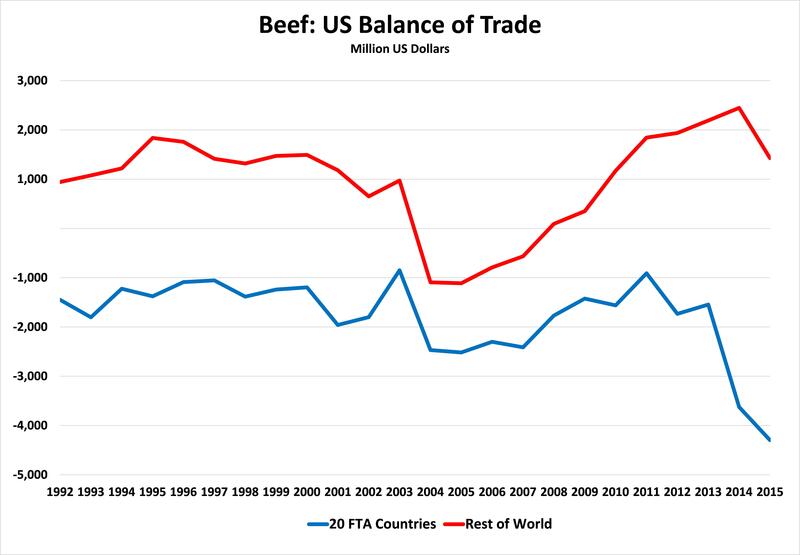 If we look at the balance of trade in beef among the countries with which we have an FTA (free trade agreement), we see that the balance of trade has worsened over the last 24 years (fig. 1), going into a steep decline since 2011. On the other hand if we look at the countries with which we do not have an FTA, the balance of trade has remained positive, except for the period following the discovery of BSE (bovine spongiform encephalopathy) in the US herd. Figure 1. US balance of trade in bovine products, comparing 20 countries with which the US has an FTA with the countries in the rest of the world, 1992-2015. Data source: US Department of Commerce, Census Bureau, USA Trade Online (http://tinyurl.com/jsltwao). 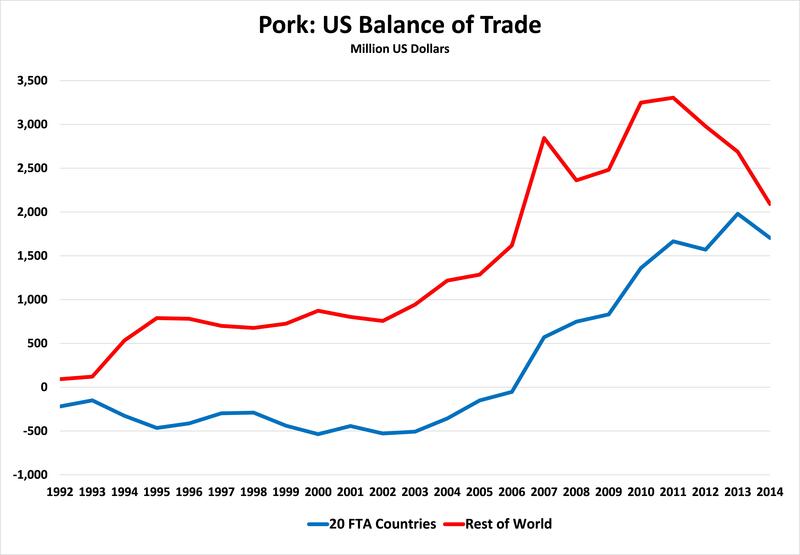 If we look at the balance of trade in pork, we see a different picture (fig. 2). The US balance of trade with both FTA countries and the rest of the countries of the world has become increasingly positive, with a downturn in the rest of the world following 2011. Two countries, Mexico and South Korea account for the bulk of the positive growth ($1.2 billion and $484 million, respectively) we see among FTA countries while trade with Canada has been negative (-$541 million in 2015). Figure 2. US balance of trade in pork products, comparing 20 countries with which the US has an FTA with the countries in the rest of the world, 1992-2015. Data source: US Department of Commerce, Census Bureau, USA Trade Online. Examining trade in sheep and goat products with FTA countries (fig. 3), we see a picture that looks more like the one we see with beef. The balance of trade in these products with the 20 FTA countries is negative and on a downward trend. The balance of trade with the rest of the world is also negative but the downward trend is not nearly so steep. Figure 3. 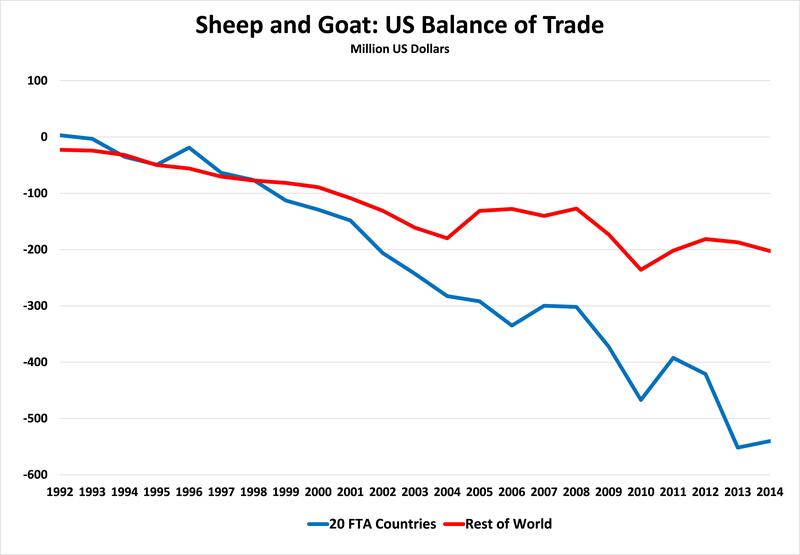 US balance of trade in sheep and goat products, comparing 20 countries with which the US has an FTA with the countries in the rest of the world, 1992-2015. Data source: US Department of Commerce, Census Bureau, USA Trade Online. Looking at trade in the major mammalian meats (cattle, hogs, sheep, and goats) one can see that the balance of trade with FTA countries has been negative over the last 24 years, reaching a low in 2015 equal to the low at the nadir of the BSE crises. The balance of trade with the rest of the countries of the world has been positive, except for 2 years following the discovery of BSE in the US. Figure 4. 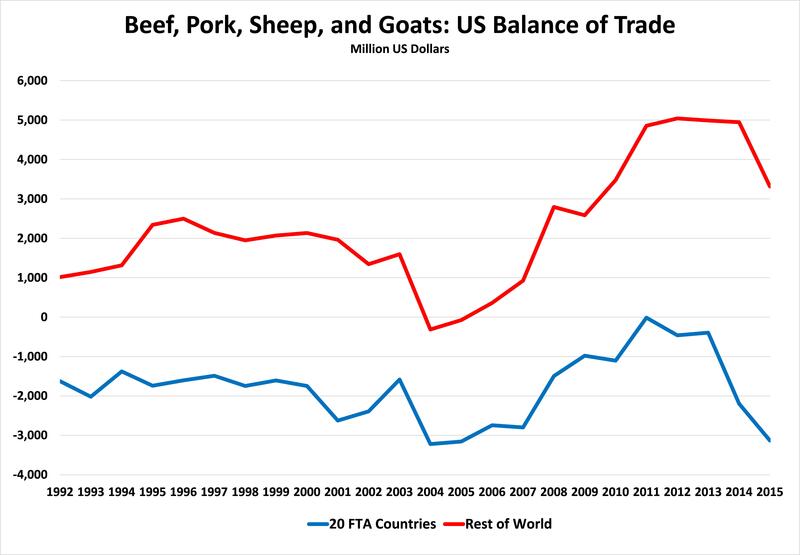 US balance of trade in beef, pork, sheep, and goat products, comparing 20 countries with which the US has an FTA with the countries in the rest of the world, 1992-2015. Data source: US Department of Commerce, Census Bureau, USA Trade Online. An examination of these graphs suggests that future FTAs will have to perform significantly better than the ones that the US has entered into over the last quarter-century. With the exception of pork, to argue that FTAs have improved the US balance of trade, one will have to look beyond trade in the mammalian meat sector.